Skunk removal is typically done by trapping. Not getting sprayed is the goal. 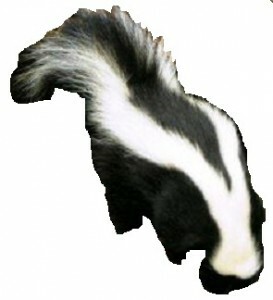 Some of our listed wildlife removal services may live catch a skunk. Live catch is usually babies if the mother is not present. There are four kinds of skunk in North America: spotted skunk, striped skunk, hooded skunk, and hog nosed skunk. The striped skunk is the most common that lives in may habitats with humans. Skunks try to live a solitary life alone and away from everything else. Unfortunately they smell and like to burrow on residential property. Mostly nocturnal animals eating insects, wild fruits, and berries. Eating mice and ground bird eggs are how the skunk survives in the winter and spring. Skunks typically have thier young in May or June. Female skunks can prolong egg fertiliation by storing sperm until needed. Litters range from 3 to as many as 10 babies at on time. Skunks can make thier own burrows or find abandoned burrows to live. Skunks can carry the rabies virus, but not all skunks are rabid. If a skunk is seen in the daytime acting abnormal such as walking in circles, unprovoked aggression, or what I call acking drunk stay away and call the city or a wildlife proffessional immediately.